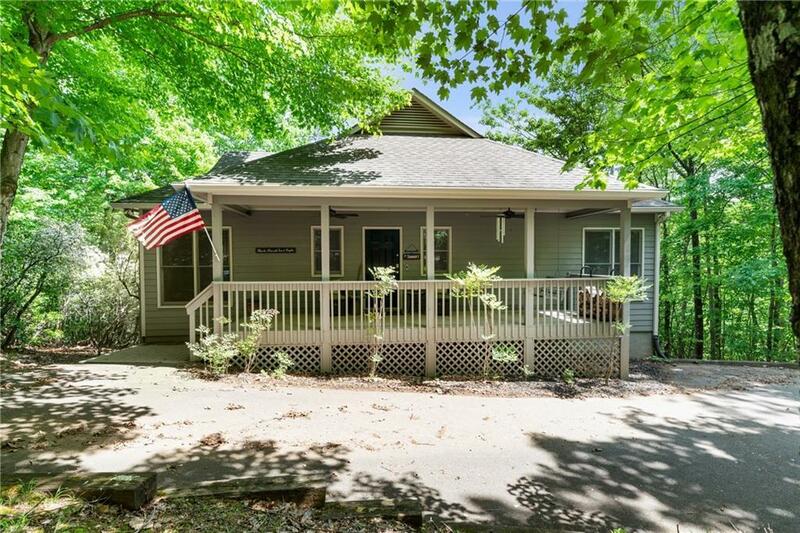 Charming 3BDR/2BA getaway on .8AC (+/-) cul-de-sac lot; privacy, mtn views; close to amenities; gentle driveway, entry; light, open, user-friendly floor-plan; Main Level features wide-plank pine floors, abundant windows; Wow! 2-story Great Rm (with Dining Area for 12+) with vaulted tongue-&-groove ceiling, wall of floor-to-ceiling windows (mtn views), stone fp, access to house-length Deck; light, Eat-In Kitchen with plenty of workspace, storage; Master on Main; Terrace Level features Family Rm, 2BDR/BA, Deck. "Smart" thermostat, exterior lights; Ring Doorbell/Camera. Directions: Wilderness Parkway To Laurel Turn; Home Is At End Of Cul-De-Sac.